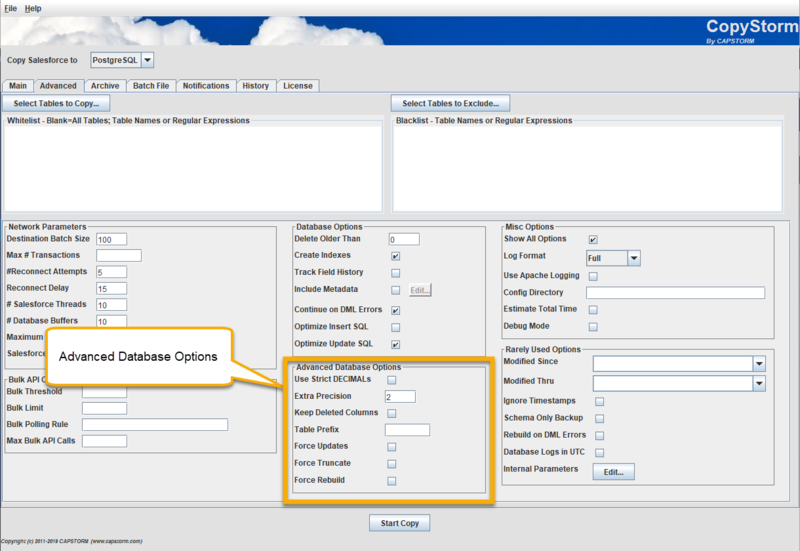 The Advanced Database Options section is used to fine-tune interactions with the target database. The default values rarely need to be adjusted. Use Strict DECIMALs No No CopyStorm uses a relaxed definition for all Salesforce numeric columns. This is because it is possible for Salesforce to store values that do not match the declared field definition. An example is the computed column Opportunity.Amount, which can be forced to exceed the field size declared by Salesforce. NUMERIC for Oracle and PostgreSQL databases. DECIMAL for SQL/Server, MySQL, and H2 databases. Extra Precision 2 No Increases the numeric precision stored by the database by this number of digits, both before and after the decimal point. The default value is almost always a good choice and works around the handful of instances where Salesforce “lies” about the precision of a column. Keep Deleted Columns No No If checked, CopyStorm will retain a column in the target database if it has been dropped in Salesforce. By default CopyStorm will drop a column in the target database if it is dropped in Salesforce. Table Prefix No If set, all Salesforce backup tables created by CopyStorm will be prefixed with this value. For example, if “Table Prefix” is set to “SF_” then the Account table will be created as “SF_Account” rather than “Account”. Note that this parameter has no effect on tables that have already been created by CopyStorm. Force Updates No No If checked, CopyStorm will write all records read from Salesforce to the target database. Records will be updated even if the timestamp is the same as the Salesforce timestamp. This option can be used in conjunction with the “Modified Since” and “Modified Thru” parameters to force CopyStorm to re-read records from Salesforce and update any fields that are out of sync. Force Truncate No No If checked, CopyStorm will truncate all data from each table and start the backup of records from scratch. Force Rebuild No No If checked, CopyStorm will drop each table and rebuild it from scratch.